According to my dad I didn’t like carrots when I was a lad! 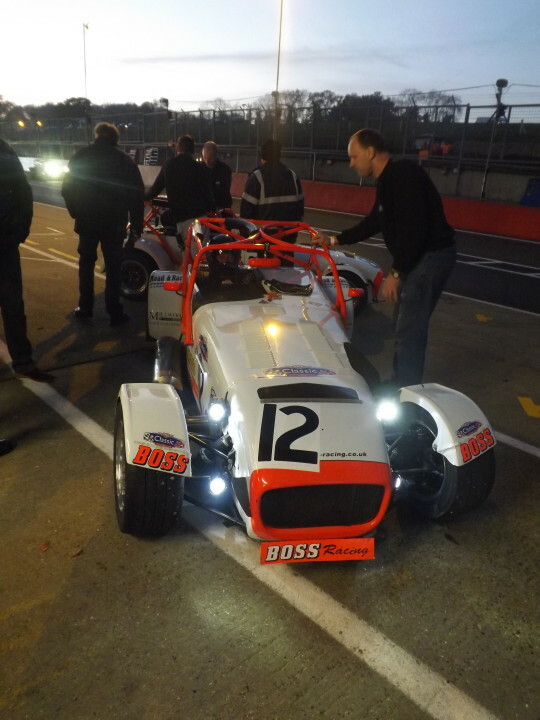 But it wasn’t so much seeing in the dark that caused me trouble during the night race at Brands Hatch on Halloween night, in fact there was too much light and most of it was coming from my main competitor. As we threaded our way past the other 30 or so cars sharing the one-mile Indy circuit Pascal Green’s lights were dazzling me so much that it was hard to see the entry point for the corners. Druids was the most difficult. Even opting to take the mandatory pit stop early in the 40-minute race didn’t help. When I saw that the Classic Sports Car Club was organising a night race at its Halloween meeting I was really excited. I was also a little apprehensive because it wasn’t something I’d ever done before. When I discussed it with Colin Watson and Tim Davis I found they agreed it was something we couldn’t miss. The other races on the programme set the scene for us. In the Gold Arts Magnificent Sevens 40-minute thrash I was first reserve but the organisers said I wouldn’t be able to start the night race if I didn’t compete during the afternoon. So I shared the drive with Colin in the Caterham R300/C400. We finished fifth overall and second in Class G. Graham Charman was eighth and first in Class D, Hugh Coulter came twelfth and third in class D.
It was Tim Davis’ chance to shine in the New Millennium and Dunlop Puma Cup 40-minuter. He, though, had to pay the price of success. CSCC rules say race winners have to carry a 60-sec pit-stop penalty: Tim had to pause for a minute. Overcoming such a penalty was a big ask but Tim very nearly pulled it off. He’d qualified on the inside of row three but soon bustled the silver TVR into the lead. The race’s second half was really tense as the big Tuscan rumbled around, chopping into the lead of Dan Wylie’s M3. But the race wasn’t long enough and Tim had to be content with a brave second place just 22 seconds in arrears. 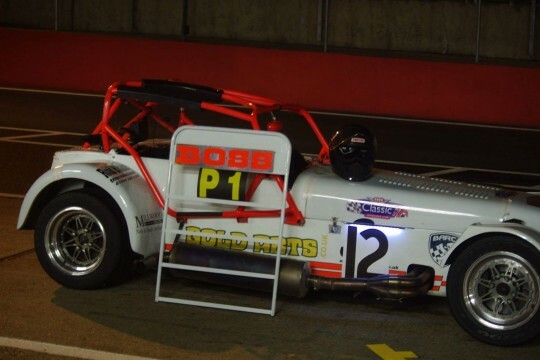 In the interval before the night race we fitted the three cars – Colin’s R300, Tim’s Tuscan and my C400 – with LED lights and anti-dazzle covers for the rear-view mirrors. Tim qualified fourth, Colin eighth and I was 12th. In free practice, though, I found myself quickest with Tim and Colin just behind. I looked like being a good race. I got a good start Pascal Green in his C400 started from 5th on the grid. We’d worked our way to the front by the fourth lap and I reckoned I was the faster but when I got past I found Pascal’s lights dazzling me so much I was having trouble placing the car. I decided the best thing to do was to come in for my pit stop as soon as possible. But as I turned into the pit lane entry I clipped the front of a Lotus Elise I was lapping with my back tyre. I apologised to the driver after the race. When I stopped I got the guys to check the tyre but it was OK. What I hadn’t expected was that Pascal had also decided to make his stop at the same time. I left the pit lane with him right behind. And we went at it again. At one point we were three abreast with an Alfa GTV: Pascal on one side and me on the other. Fortunately, the Alfa driver kept it straight! Then I managed to put a lapped competitor between us and that gave me the break I needed. By the end I was near 10 seconds ahead. My biggest problem, as it turned out, was that the race officials wanted to bring me in to check my lights. As Pascal’s were causing me so much trouble I thought I’d return the favour by distracting him when he was ahead. Operating the switch under the dashboard was a bit of a fumble so there was a bit more flashing than I’d intended. When the officials told my crew to bring me in the guys insisted I was flashing deliberately. Fortunately, the officials accepted that and allowed me to continue. It was a great race, really exciting. I don’t think I’ve come down yet! 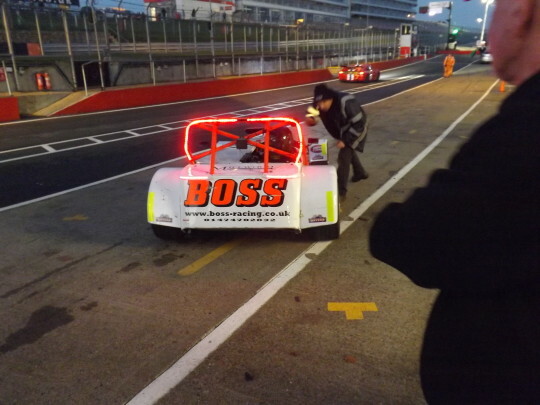 Colin was third and Tim fifth so it was another great result for Team Boss. Pass the carrots! Click here to ride on board with me!